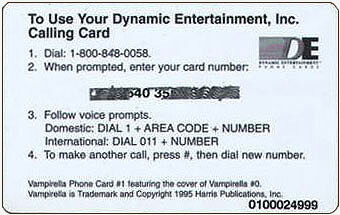 Dynamic Entertainment issued a range of Vampirella phone cards in the mid to late 1990s. These days, with the popularity of mobile phones, phone cards are a relic of the not too distant past - a good idea, but a short lived one. Some of the cards also have a "prototype" version. The story goes that these were made as samplers for the main cards before they went into production, and are the same as the regular card with the exception of the price on the front and the card number on the back. 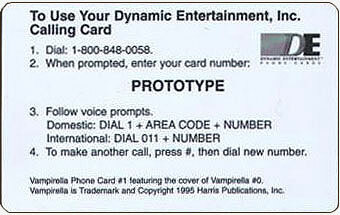 I don't know if there are prototypes available for the $10.00 cards. I would assume that there are some out there somewhere I just haven't seen them (yet)! The backs of the cards are very similar. 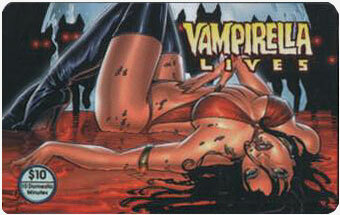 To the right I have shown the backs of a regular and a prototype card (from the Vampirella Zero card). NOTE: The pictures shown of the cards are full size. This was a limited edition of only 1,200 cards. 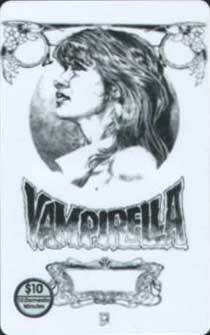 This was a limited edition of only 300 cards. This was a limited edition of only 600 cards. I am guessing that this may have been a limited run, but the card does not state how many were made on the back (unlike the others). I am sure someone will contact me and let me know one day.